Four action script triggers (on-create, on-edit, on-demand and workflow) were introduced in the post on action script type. There is another trigger: scheduled script, which is a subtle but very useful feature. Now let's walk through it to round off all the action script triggers. Scheduled Workflow Action Script, as its name suggested, is an action script which is scheduled to run on a workflow state. For each workflow state in PLM, an action can be set up to perform after the configured number of days since the state is entered. Running an action script is one of the optional actions. To set up a scheduled script for a workflow state, go to: [Administration -> Workspace Manager -> workspace –> Workflow Editor -> double click a state -> Escalation tab]. After enabling the escalation, configure when the escalated action will be triggered (must be in Integer days). In our case, we select “Run a script” as the type so that we are able to arrange an action script. After the scheduled script is triggered, it won’t be rescheduled again until the workflow state is re-entered. The scheduled script is usually used to notify certain users about current workflow state, automatically move the workflow forward and so on. But again, it is your script, so all up to you. Don’t expect the timer offering a second accuracy, so this feature is not for firing a rocket. In the last post, we talked about action script. Today, let's focus on the other two types of scripts: condition and validation scripts. Condition scripts are read-only scripts. The changes made in code won't be saved. A condition script needs to return a Boolean value (true or false) using predefined function returnValue(). The returned value is used to tell whether an outgoing workflow transition from current state is available to the user to perform or not, but it is not the only prerequisite to make a transition available. 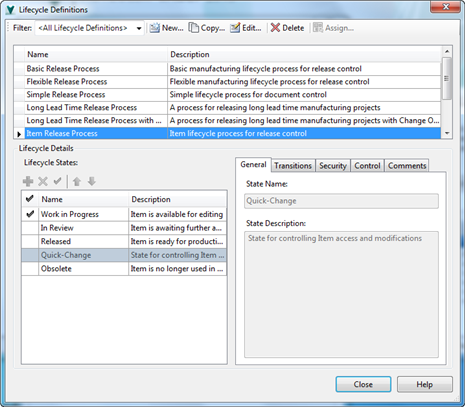 The user must also have the workflow permission of the transition. Condition scripts are triggered whenever PLM needs to determine if a workflow transition is available to a user. Each transition can only have one condition script. Each condition script can be referred by multiple transitions from different workspaces. Example 1: Transition is only available to the owner of item. // get current item's owner. // if the owner's id is equal to the current user's id, then return true; otherwise false. Example 2: Transition is only available to the users in "Admin Group"
// Security.inGroup(userId, groupName) is built-in function checking if certain user is in certain group. Validation scripts are also read-only. The changes made in code won't be saved. A validation script is used to validate certain prerequisites before allowing transitioning to the next workflow state. A validation script should return an array of failing messages using predefined function returnValue(). The transitioning will be allowed if an empty array is received; otherwise, the user won't be allowed to perform the transitioning and the returned messages will be shown to the user. Each transition can only have one validation script. 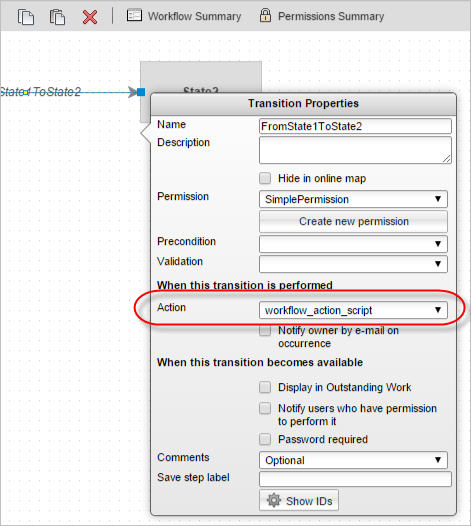 Each validation script can be referred by multiple transitions from different workspaces. Example: Item's "name" field must not be empty, and item must have an attachment at least. Every condition script on the outgoing transitions of current workflow state runs to determine which transitions are available for the current user. User chooses an available transition to perform workflow action. The validation script for that transition runs to validate all the prerequisites. If all the prerequisites are met, the action script on that transition runs. PLM Scripting supports three types of scripts: action, condition, validation. In this post, let’s focus on the action script and its triggers. Action scripts can be used to create items, edit item field values, update bill of materials, perform workflow transitions and so on. In my previous post, the script we created for the Hello World example is an action script used to update an item’s title to “Hello World”. An action script can be divided into on-create script, on-edit script, on-demand script, and workflow script according to how it is triggered. A on-create script will be triggered after an item is created (by either UI or a script). A workspace can only have one on-create script. 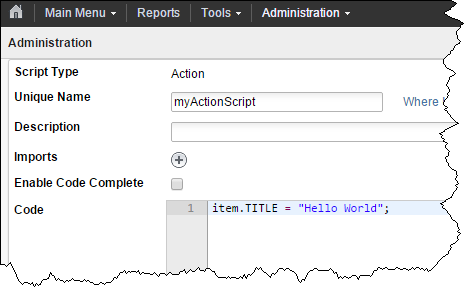 An action script can be assigned to multiple workspaces as the on-create script. A on-edit script will be triggered after any field value of an item (under Item Details tab) is modified. The changes made on the other tabs (Project Management, Relationships…) won’t trigger on-edit script. A workspace can only have one on-edit script. An action script can be assigned to multiple workspaces as the on-edit script. An on-demand script will be triggered by clicking the script icon in item’s page. The script icon is available only if the current item is not locked (which means there are workflow actions available for the current user). One workspace can only have multiple on-demand scripts. 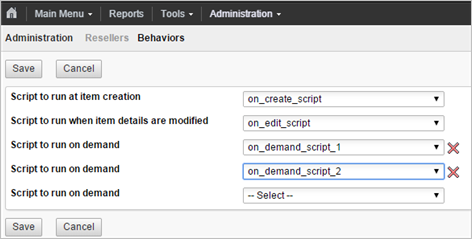 An action script can be assigned to multiple workspaces as on-demand script. A workflow action script will be triggered when a workflow action is performed on the transition which the script is assigned. A workflow transition can only have one workflow action script. An action script can be assigned to multiple workflow transitions. Hi, I'm Michal Liu, a developer on PLM 360. I will be showing you how to get the most out of PLM scripting. As this is my first post, I am going to walk through the process to create and run a simple script code. In future posts, I will dive into some topics like script types, triggers, script chain, programming tabs and so on. For now, let's just build a "hello world" code. You need to be logged in as an administrator, otherwise you won't be able to create scripts. Make sure you have a workspace W having a "Single Line Text" field named "Title". You also need "Edit Items" permission for workspace W.
To create a script code, you need go to Administration -> System Configuration -> Scripting -> click "New Script" button on the top left of the page. Leave "Script Type" as default type "Action". You can leave the "Description", "Imports" and "Enable Code Complete" as they are for now. Put the below text into "Code" and click Save button. Go to Administration -> Workspace Manager -> W -> Behaviors. Select "myActionScript" for "Script to run on demand". After the selection, another row of "Script to run on demand" pops up. It's okay. Click Save. Go to an item's page from workspace W. Click the script icon; click Confirm in the popped up dialog. If everything are correct so far. 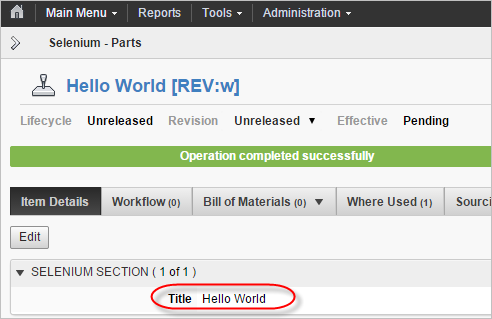 You will see a green bar saying "Operation completed successfully", and now the Title field will be changed to "Hello World".